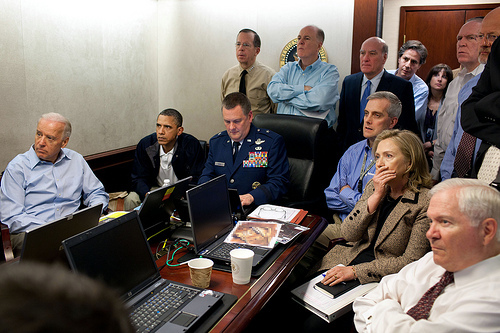 This photo is from the situation room during the operation to get Osama bin Laden. Reports are that the President and the national security team watched the operation live via cameras on the helmets of the special forces who executed the mission. Look at those faces and it’s hard to deny that they understood the gravity of the moment, the danger and the likely deaths that would take place in Pakistan and be transmitted to the basement of the White House. With repeated exposure some people can become inured to the horror of violence. But I can’t imagine the people in that room weren’t emotionally absorbed in that moment. Being exposed to the operation, seeing much of what the soldiers saw as the battle unfolded, hadto be harrowing, and has to–for someone who’s not a sociopath–make it harder to not understand the human costs that are paid when leaders send soldiers in to battle to kill, and to die. I don’t think that commanders in chief should have to watch every action. But I can’t help but wonder if the real-time availability of sound and images in the middle of a battle make it harder to thoughtlessly send soldiers to kill others and risk their own death. And I can’t help but be uncharitable and doubt that if George W. Bush ever had the opportunity to view a mission as it unfolded, as President Obama and his national security team are shown doing above, that he either didn’t avail himself of the opportunity, or failed to grasp the enormity of combat, and of death. The contrast between the atmosphere you describe here and what has been happening in the media and outside that building in general is just astounding, and really explains the bitter edge that Obama has had lately with the response to Trump and everything else. Presidents SHOULD see the cost of war — at LEAST as much as a drone operator sees.